(Central Islip, N.Y., March 2, 2017) – The three-time Atlantic League champion Long Island Ducks today announced the signing of outfielder Delta Cleary Jr. He begins his third season with the Ducks and 10th in professional baseball. Cleary Jr. led the Ducks and ranked third in the Atlantic League with a career-best .321 batting average during the 2016 season. In 107 games, he amassed 52 RBI, 51 runs, 130 hits, 19 doubles and four triples. The 27-year-old also displayed blazing speed, ranking second on the team and fifth in the league with 32 stolen bases. Defensively, he led all Atlantic League qualifying outfielders with a .991 fielding percentage, committing just two errors in 215 total chances. The Arkansas native spent the entire 2015 season with Long Island as well. 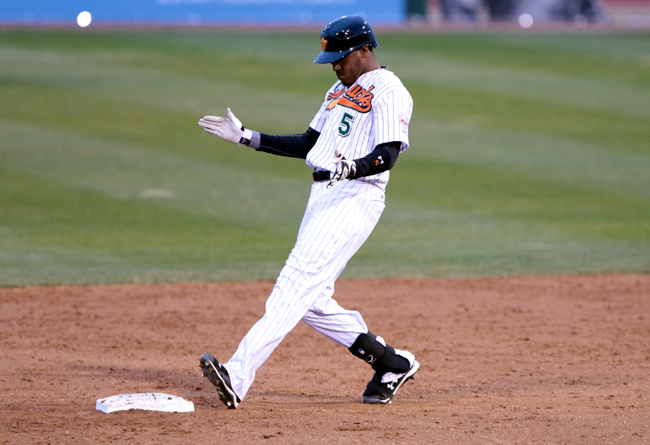 His .308 batting average was third-best in the Atlantic League, and his career-high 34 stolen bases were tied for second. He finished the year with 41 RBI, 62 runs, 139 hits, 18 doubles and four triples in 115 games while also compiling a team-long 21-game hitting streak. Prior to joining the Ducks, the switch hitter spent seven seasons in the Colorado Rockies organization, reaching as high as Triple-A, and played 10 games for the Harrisburg Senators (AA, Nationals) in 2015. Cleary Jr. was originally drafted by the Rockies in the 37th round of the 2008 amateur draft.